Create your own Custom Exhibit Labels with Pengad's Laser Exhibit Label Sheets. Perfect for all printers and, with our free label template, you can create custom labels in just minutes. Use our free label template or use your own word processing software to create your label design. Insert the Laser Exhibit Label Sheet into your printer. 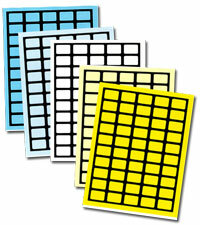 Each lettersize sheet has 50 labels with preprinted black borders for that professional look. Print as many or as few as you would like. Available in 5 label colors: Pastel Blue, White, Pastel Yellow, Dark Blue, and Dark Yellow. Click here for custom exhibit labels. Click here to download the exhibit label template.